A nationwide alert has gone up about a big rise in Dengue cases across the country. The haze problem, caused by forest fires, in nine northern provinces of Thailand is now posing a serious threat to health, with the level of PM2.5 particles recorded at 66-200 microns, the Pollution Control Department reported today. A cyber-security bill introduced just weeks ahead of Thailand’s first democratic election since a 2014 military coup has stoked concerns that it could be used as a weapon to stifle political dissent. Line Thailand and Line Ventures are setting aside US$20 million to empower Thai startups through its post-accelerator program, Line ScaleUp. The cabinet of Thailand has recently approved a proposal from its finance ministry to remove the excise tax for full electric vehicles from January 1, 2020 to December 31, 2022. Since the enactment of the Thailand’s Trade Competition Act B.E. 2560 (2017) (“2017 Act”), the Trade Competition Commission (“Commission”) has published multiple notifications clarifying the full scope of a number of provisions in the 2017 Act. 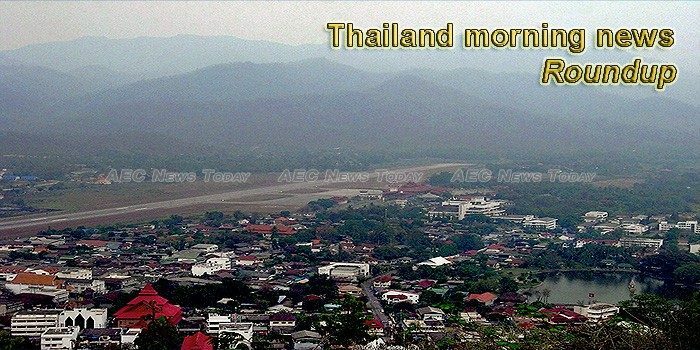 Smog-induced poor visibility has forced Bangkok Airways to cancel its morning flights between Chiang Mai and Mae Hong Son until Saturday. Higher shipments of pineapples to Australia are anticipated this year after Australia lifted its anti-dumping duty imposed on imports of Thai canned pineapple used in the food industry. The Stock Exchange of Thailand plans to commence digital asset trading operations on a new exchange next year, with core infrastructure projected to be completed in the third quarter. The Ministry of Labor has worked with government and private agencies to provide career advice to the elderly to promote employment among the demographic. THE NATIONAL Education Bill – which was drafted in the hope of bringing better changes to the Kingdom’s educational sector, is far too flawed to sail through, a prominent educator said. hailand’s military-installed prime minister crooned a love song and boasted of his government’s achievements Wednesday during an official visit to his home province in the northeast ahead of the March 24 election. Areas of Patong, Kata and Karon will have reduced pressure in their mains water supply for a week starting next Monday (Mar 25) which will leave some residents and businesses without water, the Phuket office of the Provincial Waterworks Authority office has announced. While the Yom River at tambon Wang Chik of Phichit’s Pho Prathap Chang district has almost dried up, provincial governor Worapan Suwannus has set up a command centre for drought prevention and mitigation. A stowaway dog which managed to get on a cargo ship in Thailand and sail all the way to Hong Kong was put down by the government on Wednesday. The weekly Cabinet meeting has allocated another five billion baht to support rice agriculture during the current production year. Samitivej Hospital has joined forces with other organizations to launch Thailand’s first virtual medical service application in its latest bid to improve the public health sector. Tremors were felt in many areas after a 4.1 magnitude earthquake hit Wang Nuea District in Lampang, centered 2 kilometers underground. Thai PM Prayut Chan-o-cha says he’s concerned over public safety in risk areas of tropical storms that have been forecast for the northern regions up until next Tuesday. The following is a press release from the Soi Dog Foundation, based in Phuket, released due to the Deputy Mayor announcing last week that the city wanted to remove all the stray dogs from the Jomtien Beach area and put them in shelters. The Technology Crime Suppression Division on Thursday warned people against transmitting fees to those who offered loans via Facebook, saying a lot of people have fallen prey to scams. Two representatives of the online group “Ganjachon” went to Laem Chabang police yesterday to outline their proposals for a fair to be held in April that is expected to attract up to 3,000 people. No major political party has a policy to amend the controversial lese majeste law, an international human rights organization revealed Thursday. South Koreans have been arrested for operating an illegal online gambling website from a condo in Pattaya. After repeated complaints from local residents on packs of teenagers racing their bikes with loud exhausts up and down streets during the early morning hours, Pattaya Police took action this morning, March 14th, 2019 at 4:00 AM. The Ministry of Digital Economy and Society has reasserted that the Cybersecurity Act was designed to increase the country’s capacity to fend off cyber threats. An endangered green turtle stuck in fishing boat was rescued and set free again by the navy. Siam Piwat Co., Ltd., the owner and operator of prestigious retail developments such as Siam Paragon, Siam Center, Siam Discovery, and joint venture partner of ICONSIAM, Thailand’s new mega-landmark, announced its commitment to be a leader in Creative Economy and take Thailand on to the world stage with its projects. The Prime Minister of Thailand, Gen Prayut Chan-o-cha, on Tuesday asked citizens to use natural resources, especially water, more efficiently ahead of the upcoming drought season. Here at The Tokenist, we’ve been following the crypto news in Thailand very closely. That’s because exciting things have been happening which could position the country as one of the leading crypto hubs in Asia. Exchanging views: Thai Foreign Minister Don Pramudwinai (left) speaks with President Joko “Jokowi” Widodo (second right), who is accompanied by Foreign Minister Retno LP Marsudi (right), at the Presidential Palace on Wednesday. King Mongkut’s University of Technology North Bangkok has a long history in establishing Thailand’s advances in different areas of engineering, technology and applied science since it was established in 1959, initially called ‘Thai-German Technical School’, and later on became a state university called ‘King Mongkut’s Institute of Technology North Bangkok’ (KMITNB). The largest and most active insurgent group in Thailand’s Deep South marked its 59th anniversary Wednesday with a videotaped message asking the international community to help solve the long-running conflict and pledging to carry on with its separatist fight. Firefighters struggled to control a major fire at a plastic waste-separating factory in Nakhon Ratchasima’s Noen Sung district which began on Wednesday afternoon, and estimated that it would take another day or two to be completely extinguished. Prime Minister Prayut Chan-o-cha was concerned over public safety in risk areas of tropical storms and instructed all authorities to promptly take preventive and relief measures. Taiwan is offering education opportunities for Thai students under its Taiwan Scholarship Programme which applicants can apply for until the end of this month.